VolleyMob assembled our own NIVC Dream Team including two outside hitters, an opposite, two middle blockers, a setter and a libero, after the title was awarded and 31 matches were played. Ole Miss swept Texas Tech to claim the first NIVC title since its reboot this year. Emily Stroup knocked down 19 kills to lead Ole Miss to the NIVC Finals with a sweep of West Virginia. In a clash of former Big East counterparts, the current Big 12 bunch (West Virginia) took care of the ACC squad (Syracuse) in straight sets. The Mountaineers now head to the NIVC Semifinals. All three sets were extremely close for the match, as a total of 25 ties and 14 lead changes occurred. In all three though, the Mountaineers had what it takes to close things out as they were the better team in crunch-time situations. West Virginia held an edge in the attack as well as serving (four aces: four serve errors vs. two aces: five serve errors) and in digs (53-41). The difference maker in both was Payton Caffrey, who logged an incredible 19 kills (.250) in just three sets in addition to three aces and five digs. Mia Swanegan also was efficient out of the middle with seven kills on a .316 mark while Lindsay Proctor paced the defense with 14 digs. For Syracuse, they won the battle of the block (9-4) with Amber Witherspoon (eight kills, .357, six blocks) leading the way. Belle Sand (16 digs) was also solid on the defensive end, but it wasn’t enough as the Orange only hit .151 with just 29 assists for the night. 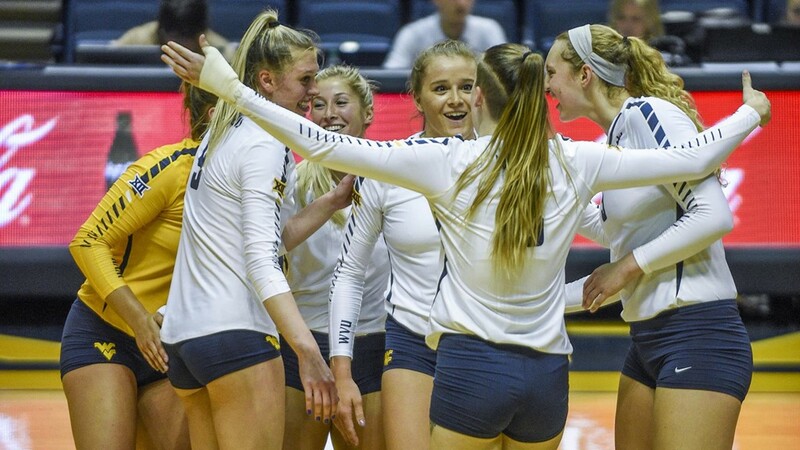 Give credit to the Mountaineers too though, as they locked in defensively and held Syracuse’ three top attackers (in terms of total attempts) to 18 kills with 12 errors on 70 attempts (.086). Beyond the action, the match had something behind it as well. West Virginia joined the Big East in 1995 for Women’s Volleyball and was a member of the conference with Syracuse. They never had a 20+ win season and finally earned one in the Big 12 a few years back. Sure enough this year they have over 20 and added yet another postseason victory over a team that reminds them of their former conference struggles in Syracuse. With the win and the great story fueling them, West Virginia will head to the NIVC Semifinals to take on Ole Miss. It’s not determined the time or date yet, but it will occur at some time between December 5-9.